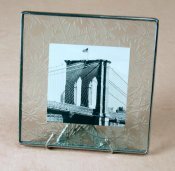 Glass photo frames handcrafted in New York City by designer Ingo Williams. disc of a spring holds the photos in position with tension. hand in Brooklyn using architectural glass and stained glass techniques. 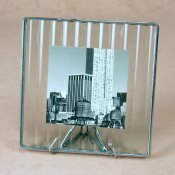 This 5x5 glass photo frame will accommodate a 3x3 image perfectly but can also handle images slightly larger or smaller. 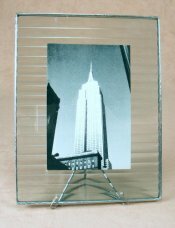 The double-pane construction makes for easy replacement of photographs. 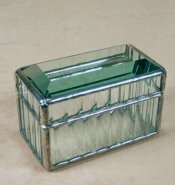 Made in New York City by Bedord Downing Glass - Boxed Pattern: Etched Silver metal trim Includes unique glass easel/stand Also available as a double frame - please use the drop-down menu!